The newly re-designed Pride Sundancer 3 wheel scooter offers contemporary styling and superb performance in a nimble, luxury scooter. The Sundancer offers a huge variety of critical standard features such as power elevating seat, full light kit (including head light, tail light and directional signals), solid tires for low maintenance, and angel adjustable, swivel medium back seat. The Sundancer is the ultimate choice for a compact, high performance scooter! The power elevating seat is standard, and offers the user many needed options, such as the ability to reach kitchen counter height, the ability to raise or lower the user to the level needed to transfer to different levels (toilet, bed, commode, etc..), the ability to reach high items on grocery store shelves and kitchen cabinets. 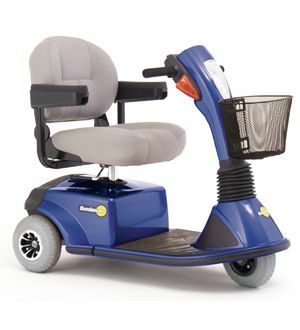 The power seat allows the user to be much more independent and eases the lifting for the caregiver. an additional 7" from normal seat height. with semi reclining back and width adjustable armrests. Weight of heaviest piece - 61 lbs. Weight w/o batteries 150 lbs. for a great look and easy maintenance. Adjustable tiller to fit most any user. size to work well outdoors over light grass and gravel.